Sndplay plays the PC speaker sound effects for the following games: Catacomb, The Catacomb, Slordax, Commander Keen: Invasion of the Vorticons, Rescue Rover, Hovertank 3D, Paragon, Street Ball, Duke Nukum, Cosmo's Cosmic Adventure, Major Stryker, Shadow Knights, Math Rescue, Pickle Wars, Dangerous Dave and Dangerous Dave in the Haunted Mansion. For Dangerous Dave you need Davesnd and for Dangerous Dave in the Haunted Mansion you need Dave2snd because the sounds are stored inside the EXE and these programs get them out of there. You can download Sndplay here. Download Daveshow here, Source included. The start recording a demo level keys should be pressed while a level is loading. These cheats only work when you press the keys in the correct order, e.g. press F first, then press F12. When Dangerous Dave in the Haunted Mansion is started with the "/LEVEL" parameter, the file "Tedlevel.dd2" is read (if it exists). The first 16-bit little-endian integer of the file is interpreted as the level number of the level to start with. Dangerous Dave's Risky Rescue and Dangerous Dave Goes Nutz! These cheats only work when you press the keys in the correct order, e.g. press G first, then press CAPS LOCK. In Dangerous Dave 1, you can enter warp zones that transport you to bonus zones with lots of goodies and lots of perils. To enter these you've got to jump off of the upper left or upper right corner of the level. This can be done on levels 5, 8, 9 and 10. Dangerous Dave demonstrates dexterity during dangerous deed. Level 6 of Dangerous Dave 1 is quite a dangerous and difficult level, but with this little hint it becomes much easier. In level 6 get the jet pack and the gun, shoot the creature and then go straight to the exit. Fly with the jet pack through the exit. Now don't jump off of the upper left corner of this level just like in the hint above, because then the game will crash. Instead go to the right. You will now enter the warp zone of level 8. Here are the maps of all the levels of the Apple II version of Dangerous Dave. You can download DD1Maps here. The Video Game Atlas My Dangerous Dave Apple II maps are also on this site. It also has maps of the DOS version, but I didn't make those. Pixelmusement - Ancient DOS Games - Episode 25 A video review of Dangerous Dave. Pixelmusement - Ancient DOS Games - Episode 243 A video review of Dangerous Dave in the Haunted Mansion. Planet Romero The creator of Dangerous Dave character. He also has an interesting story about all the Dangerous Dave games. Did you see my name on the news page? Look for an astute Dangerous Dave Historian from The Netherlands. Gawd's Museum of Dissected Games has information about the file format of Dangerous Dave in the Haunted Mansion. 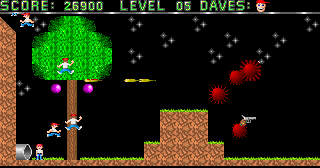 Dangerous Dave at TASVideos A tool-assisted speedrun of this game. id Software The creators of some Dangerous Dave games.